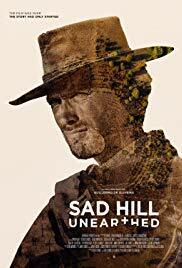 Sad Hill Unearthed tells the story fans of The Good, Bad and the Ugly who chose to restore the epic graveyard scene from the film. This cemetery lies in an untouched region of Burgos and in 1966 Spanish soldiers built 5000 fictional graves. They also took part in the film playing extras. Once filming came to end the site slowly faded from view. Then in 2015 a group of fans chose to try to find the cemetery. The group did so and along with volunteers from France, Italy, Germany, Turkey, and the US brought the cemetery back to its original look in time for the 50th anniversary of The Good, the Bad, and the Ugly. Also in the film include interviews with Gremlins director Joe Dante, composer Ennio Morricone, cult director Alex de la Iglesia, and Metallica lead singer James Hetfield. Sad Hill Unearthed tells an amazing story of fan appreciation, site itself, and its special place in cinematic history.